He said the mission is a focussed project under National Programme for Bovine Breeding and Dairy Development, with an outlay of Rs 500 crore during the 12th Five Year Plan. "During 2014-15, Rs 150 crore will be allocated for development, preservation and conservation of indigenous breeds," said the minister. 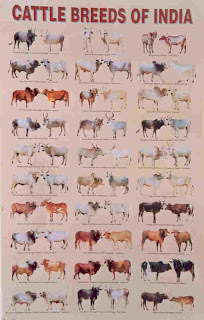 The mission will also undertake breed improvement programme for indigenous cattle breeds to improve the genetic make-up and increase the stock; enhance milk production and productivity; upgrade nondescript cattle using elite indigenous breeds like Gir, Sahiwal, Rathi, Deoni, Tharparkar and Red Sindhi besides distributing disease-free high genetic merit bulls for natural service. The Gokul Grams will be established in the native breeding tracts and near metropolitan cities for housing the urban cattle. It will act as centres for development of indigenous breeds and a dependable source for supply of high genetic breeding stock to the farmers in the breeding tract. The Gokul Gram will be self-sustaining and generate economic resources from sale of milk, organic manure, vermi-composting, urine distillates and production of electricity from bio gas for in-house consumption and sale of animal products. It will also function as state of the art training centre for farmers and breeders.